In the mid 1990s, Mike Riley was the offensive coordinator and QB coach of USC. There was a QB that he tried to recruit, but the player signed elsewhere. A few years later, as head coach of the Chargers, Riley still liked the kid enough to want to draft him but GM Bobby Beathard overruled him. In the third act of his Greek tragedy, the player that escaped Riley twice would beat him in their only match up against each other, throwing his first TD in the NFL in that game. Chip Kelly should have that story ready if Howie Roseman shoots him down on a draft recommendation. Taking a look at this year’s draft class, there are quite a few players that Kelly missed out on on Signing Day (insert Willie Lyles joke here, and make it good), and the Eagles might make sure that doesn’t happen again on draft day(s). 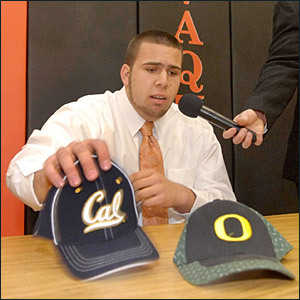 Kelly is still upset Kevin Hart chose Cal. With the Combine this week, I went through every player from an FBS school that is invited to see who Oregon tried but failed to recruit. In which I spend way too many words on the Eagles coaching staff. I think Chip Kelly was the best hire the Eagles could have made. Maybe he won’t turn out to be, maybe he will, time will tell. I’m not completely sold on him but there wasn’t anyone out there that was clearly better. There’s things to like and legitimate reasons to be doubtful, of course nothing’s guaranteed. That’s also a fair description of his staff. Chip Kelly finally announced his staff on Monday. Finally the local media can stop complaining about it instead of ignoring their jobs and actually researching these coaches for what they bring to the team instead of just reading Wikipedia and proclaiming “everything you need to know” about the staff. Since we’re 7 months away from kickoff and there’s nothing else to talk about, I’ve taken a closer look at the staff. I started out thinking this is a weak collection of coaches, but the more I read the more I came around to it. For the most part I like the assistant coaches and I’ll give Kelly the benefit of the doubt on these, but the coordinators should be held to a high standard and they are weak hirings. On face value, the staff is a good mix of college coaches and NFL coaches, experience and youth. But you have to dig deeper than face value. Kelly can hire 100 guys who share his philosophy and talk a good game, but at the end of the day results matter. Kelly’s coordinators are thin on results in those roles, but nearly all of his assistants have a track record of success at something. Let’s start with the offense, since that is Kelly’s forte.